relenet is a platform to operate web 2.0 communities - or what we also call social network communities - under your own brand. 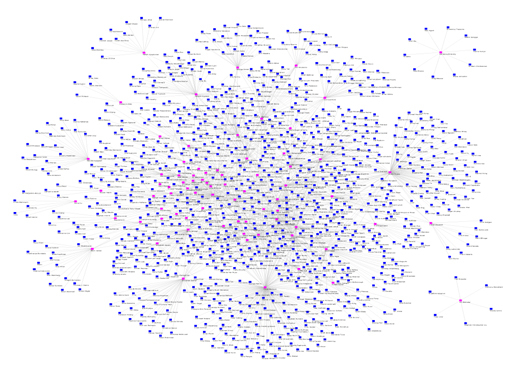 Relationship networks are modelling human contacts and relationships, as well as the needs, desires, skills, talents, the knowledge, preferences and the offers of its members. It provides a wealth of information to its members about other people and allows to manage friends and business partners in a stimulating and effective environment. The graphic may help to picture a web 2.0 community or social network at a glance. It demonstrates the members of a relationship network (the dots) and the relationship between its members (the lines). 3MFuture operates the platform relenet. It allows for a speedy set up of your own web 2.0 community or social networking web 2.0 community under your own brand, i.e. as a white label social network solution. The relenet web 2.0 community platform in addition promises a reliable performance of your site. Companies - INTERNAL - to support knowledge exchange, i.e. to retrieve and to exchange knowledge, and to provide a place for discussions amonst its employees about work-related topics. 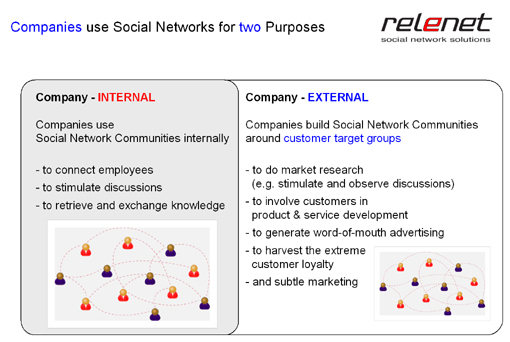 Companies - EXTERNAL - make use of social software and build social networking and web 2.0 communities around their customer target groups to do market research, to involve customers in product and service design, to generate word-of-mouth marketing and to harvest the extreme customer loyalty that members of social networking sites exhibit. Advertising & Branding Companies - build and operate a social community around the interest topics of their clients or around the topic of its products and services. to describe what they are looking for. To ensure that skills and knowledge are found and leveraged from within the project. To give project members a plattform to express their opinions and to give project members a discussion space that is fun. Industries - to bring all the players together in one social network to exchange value. Organisations - to help its members with networking and knowledge exchange even though they are locally distributed. Clubs & Communities - to help web 2.0 community building and to gain new members. There you will also find our Click-Demo, a Powerpoint slide show depicting the functionalities of the relenet web 2.0 social network communities in five minutes. LungcancerC - the web 2.0 community that connects patients, clinics, physicians, specialists, relatives to find help. 2000-2016 All Rights 3MFuture Ltd.